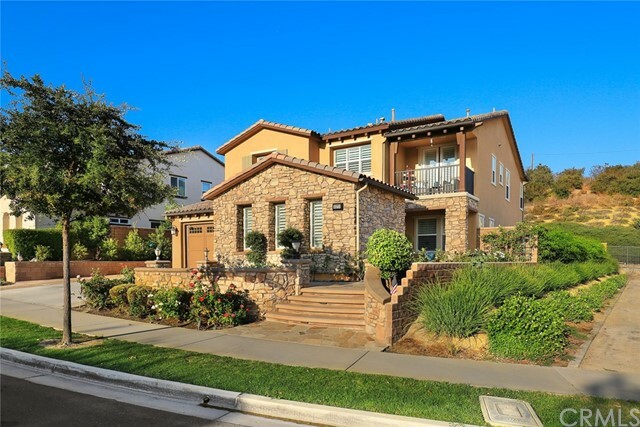 Come see this Brea property found in the award-winning Brea-Olinda Unified School District! Built in 2012, this highly presentable home has everything you need for you and your family. From the outside, you will immediately fall in love with the home’s modern stone work. As you enter the home you will notice the beautiful hardwood floor and recessed lighting that complement the house’s modern atmosphere. The dining room is the perfect size for family meals, and the kitchen is fully furnished with granite countertops, stainless steel appliances, and an oversized island. From the great room you can access the beautiful backyard space that is perfect for hosting large gatherings. Each room is comfortably spaced and offers the right amount of natural lighting. Full bedroom suite downstairs that’s perfect for guests or elderly parents. Also followed by a large office space with a built-in desk downstairs. The master suite on the second floor offers a bathroom with a tiled shower, a bathtub, and two walk-in closets. There is also a patio with an even better view of the area from the second floor. All of this is within the illustrious Blackstone Community, where you will enjoy amenities such as the community pool and spa, outdoor fireplaces, BBQ area, children’s activity center, and several parks. Conveniently close to local trails, the Brea Sports Park, Carbon Canyon Regional Park as well as a golf course and shopping plazas and restaurants.